The tubular design of the crow quill has been around since steel pens were first introduced en masse in the 1820s. When one thinks of a crow quill nib, it is easy to envision fine detailed architectural renderings, retouching old photographs, cross-hatching shadow areas of pen-and-ink drawings. When the crow quill was introduced well over a century ago, it was indeed designed for draftsmen and lithographers who used it for fine work on printing plates. They are great for retouching broad pen lettering as well. The flexible crow quill, able to render the finest hairlines and thick shades, is a wonderful pen for both copperplate and spencerian/ornamental scripts. They are as fine as a mapping pen and hold more ink. Much more ink! The good news is that there are several excellent crow quills manufactured today. The tubular design of the crow quill goes back to the dawn of the steel pen in the 1820s. Originally, steel pens were made to fit over a round, straight holder, usually made of wood. 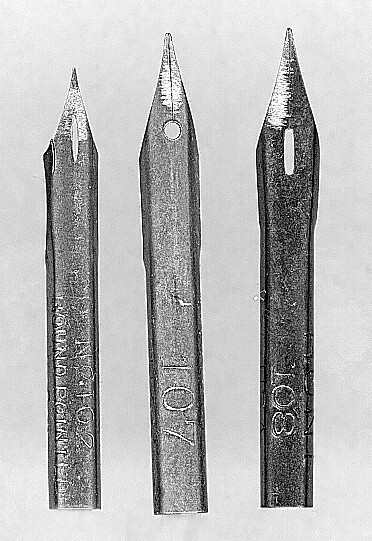 Within about ten years, the slip nib was introduced, so named because it was designed to “slip” into a slot in a straight holder or the flange of an oblique pen staff. Slip nibs are the pens we are most familiar with. 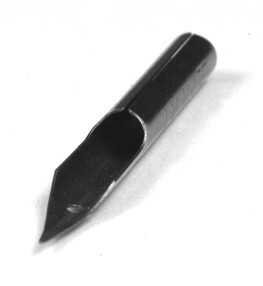 As slip nibs became the norm, the tubular design was not forgotten. It shrank into the crow quill design and also ballooned into some novelty pens in the 1880s. These latter pens, while nice to look at, are not easy to write with. As the pens are long—upwards of four inches in length—the hand must grip the smooth metal. Consequently, the pen tends to slip and is difficult to control. The novelty pen fad was short lived. The earliest tubular pens were designed to be fitted over wooden handles. These two date from about 1840. Should you see any tubular nibs available on Ebay, be careful not to confuse them with larger nov- elty pens of seemingly similar design that were a fad circa 1880 and often used for promo- tional purposes. At left is a mod- ern Hunt 102 crow quill, barely an inch long. To its right is a tubular pen from Mark Winkley, a stationer and printer from Lon- don. 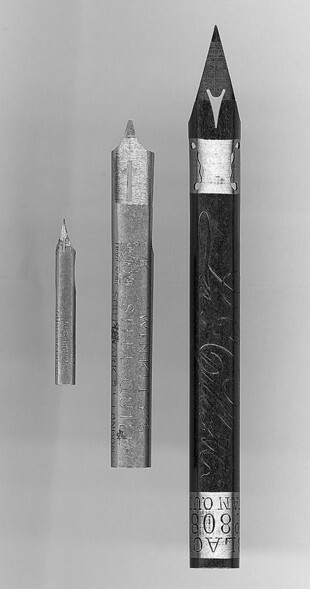 At far right is a Gillott Swan Quill, a monster of a pen at more than four inches in length. Crow quills manufactured today tend to be superfine and extremely flexible. They are ideal for copperplate and spencerian style script. There are several excellent pens to choose from. With the exception of the Hunt 107 Hawk Quill, which is very stiff, all exhibit the same superfine and flexible qualities. Vintage crow quills are not easy to find. Rarely do they show up on Ebay and those I have found were mainly mixed loosely into other nibs. The gallery of nibs that follows represents my own collection. As I become aware of more, I will pass them on. Any member who has a crow quill not mentioned here is welcome to send me one to review. We will all benefit. Hunt 102, 107 & 108. The 102 is the finest and most flexible of the trio. The 108, almost as fine and flexible, is larger and capable of broader shades. In the middle is the 107 Hawk Quill, quite stiff, but fine. All are still made. 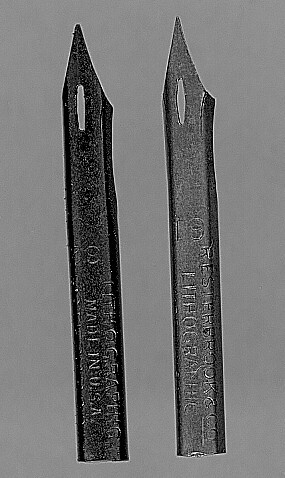 Two crow quills from Gillott. Left is the 850 Long Shoulder, a fine and flexible nib similar to the Hunt 108. It is no longer offered. The Gillott 659 Lithographic Crow Quill has been around for a long time. Very fine and super flexible, it is terrific for copperplate and spencerian type script. The modern Brause 515 is the largest crow quill in this group at one and one- quarter inches. It is probably most like a regular slip nib in that with its size, it has side slits for added flexibility and can hold a voluminous amount of ink. Its fine to medium point is excellent for script writing. Two vintage crow quills from Esterbrook, the #61 and #62. For writing script, the 62 is probably best. It is very similar to the Gillott 659. The 61 is similar to a fine mapping pen and is so fine that it will be difficult to write with. These pens are no longer made as Esterbrook has been gone for nearly half a century. Soennecken’s two vintage crow quills are terrific writers. The larger 140 is likely the best for copperplate and spencerian script as it can create a thicker shade, but the smaller 141 is quite good on its own. Kueffel and Esser has long been a supplier of drafting supplies. Their old #3200, no longer offered, is an excellent writer. Originally, crow quills were intended for straight penholders. 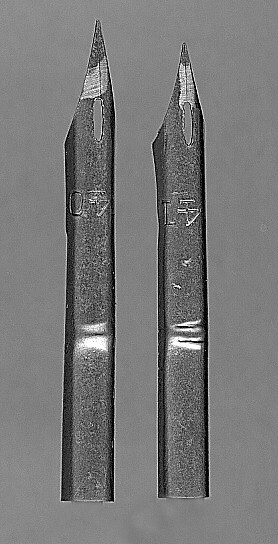 Unlike other tubular nibs, crow quills fit inside their holders. They have been a standard width for years so crow quill holders made a century ago will fit nibs made yesterday. For writing script, most writers will want an oblique penholder. There is only one made today and that is the PIA holder from Paper & Ink Arts. The PIA penholder from Paper & Ink Arts. Note the rounded section of the flange. See arrow above. Crow quills fit there. 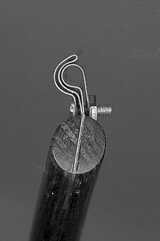 Presently, this is the only oblique penholder made for crow quills. 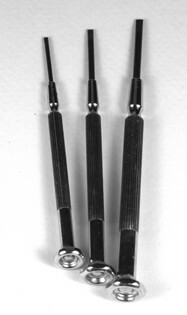 The PIA oblique holder has a straight shaft and many pointed pen advocates prefer a pen staff with contours similar to those offered for slip nibs. Currently, there are none on the market, but it is easy to make one of your own. It shouldn’t take more than about ten minutes to fashion. What you will need is an oblique pen-holder with a brass flange. A plastic Peerless-type holder is sufficient. You will also need some small screwdrivers such as those used by jewelers, and a pair of needle-nosed pliers. The screwdrivers (see Figure 1) are easy to find and you will need the smallest to the size where the shaft is equal in width to that of the crow quill. Use the slot variety. In this example, I used a Mike Sull oblique holder. 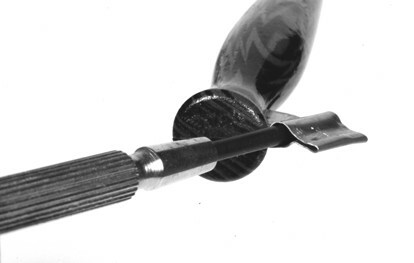 Beginning with the smallest screwdriver, work it into the flange as in Figure 2. Insert the shaft of the screwdriver all the way through. Repeat this until you reach the size that is equal in width to that of the crow quill. Now try to insert the nib. Work the screwdriver to enlarge the hole until the nib fits snugly. 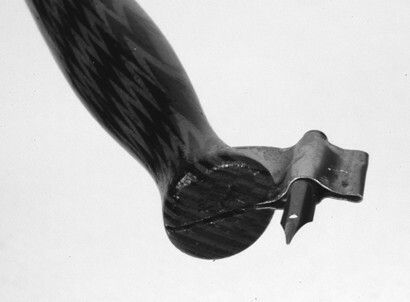 Once the nib is in, gently pinch the flange per the arrows in Figure 3 to set the nib in place. Do not pinch too tightly. You might distort the nib with too much pressure and damage the point. Just tight enough so that the crow quill does not move as you write. When you have reached that point, you are ready to write.